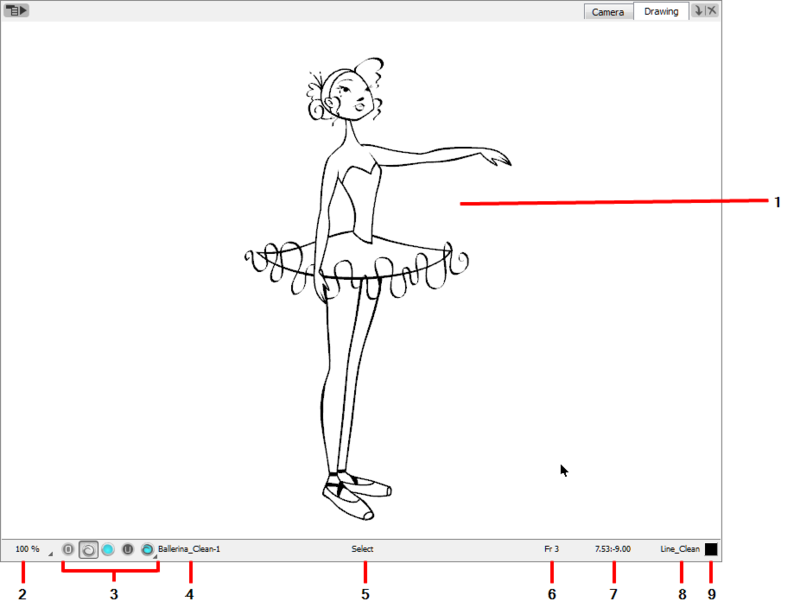 In Toon Boom Harmony, you can draw in the Drawing or Camera view. Although the two views are similar, when it comes to drawing, there are some differences. Only the selected drawing is displayed by default in the Drawing view. You can use features, such as the light table to display the current frame drawing of all the enabled layers of your scene in washed-out colours, or the Onion Skin to display the previous and next drawings of the currently selected drawing layer. This indicates the position of your mouse cursor in the drawing area. Displays the name of the currently selected drawing. The Colour Picker allows you to select a colour to draw with.